Dr. Peter Palacio has been a champion for women’s health for more than 20 years. A board certified physician in Obstetrics & Gynecology, he specializes in mid-life and menopausal health and wellness with a high level of expertise in minimally invasive gynecologic surgery. Dr. Palacio is proud to have introduced laparoscopic hysterectomy to the Central Oregon community and is the first and most experienced local practitioner to provide robotic GYN surgeries. As a skilled practitioner and the state legislative chair for the Oregon Section of the American College of Obstetrics and Gynecology (ACOG), Dr. Palacio is leading the charge to establish health care practice guidelines for physicians, providers, and patients state-wide. He has also served as both vice chair (2006-2009) and chair (2009 – 2012) of Oregon ACOG and is currently an active member of the Central Oregon Medical Society. Dr. Palacio was a founding partner of Bend Obstetrics and Gynecology in 2002. 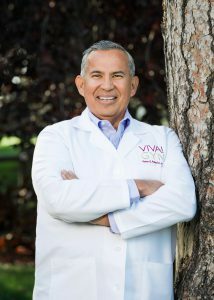 In 2013, he fulfilled a dream with the launch of his specialty practice VIVA! GYN. With a focus on peri-menopause, menopause, and sexual health, VIVA! GYN is designed to empower women on their voyage through the transition beyond the child-bearing years. Working in private practice, Dr. Palacio served as chairman of the Department of Obstetrics & Gynecology for St. Charles Medical Center in Bend where he is currently an attending staff physician in the department of Obstetrics & Gynecology. In his quest to bring advanced and minimally invasive medical techniques to Central Oregon, Dr. Palacio has co-authored numerous studies on the use of laparoscopic procedures in gynecologic medicine. His work has been published in the Journal of Pelvic Surgery and the Journal of Reproductive Medicine. Dr. Palacio is active in the Central Oregon community and currently serves as a member of the specialty advisory board for the Bend Volunteers in Medicine Clinic. He has three adult children and enjoys restoring and showing classic cars, horseback riding, golf, and downhill and cross country skiing.